In 1907, Sir Shackleton led an expedition in the South Pole. In 2007, 11 intact bottles of "Mackinlay" were discovered under the ice of the base camp of Shackleton. Richard Paterson has recreated this whisky with Single Malts from the Highlands. At the beginning ot the XXth century, Sir Ernest Shackleton led one of the most famous expeditions of the South Pole. 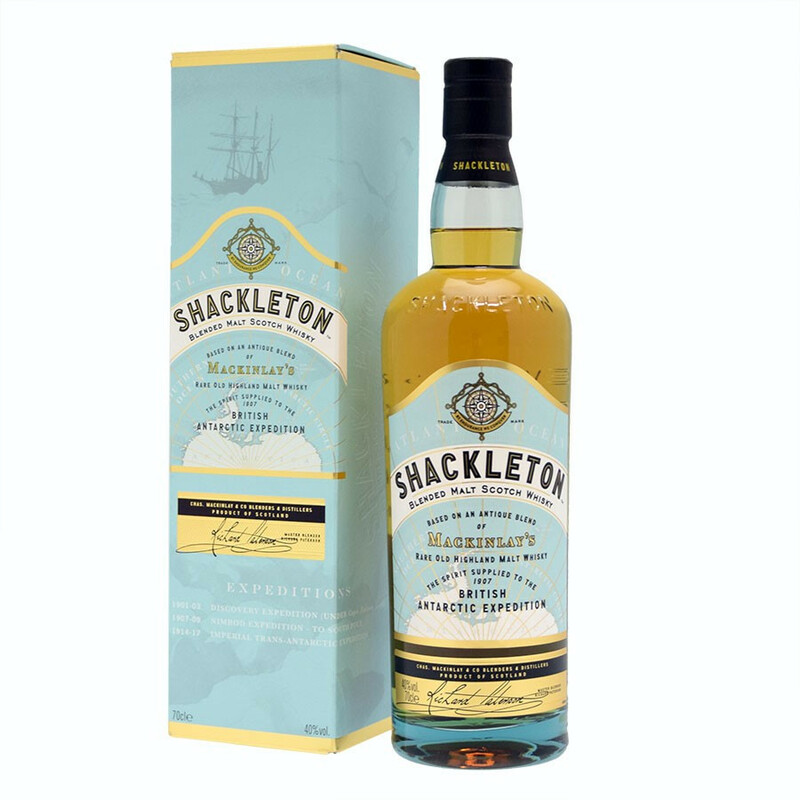 To carry out his expedition in 1907, Shackleton ordered 25 cases of Malt from the Highlands "Mackinlay". The expedition didn't come to an end and Shackleton and his team had to retrace their steps leaving their whisky behind. In 2007, 100 years later, 11 intact bottles of "Mackinlay", perfectly preserved, were discovered under the ice of the base camp of Shackleton. Inspired by the story of Shackleton, Richard Paterson, Master Blender for Whyte and Mackay, which owns the distilleries of Jura and Dalmore, has recreated this whisky with Single Malts from the Highlands. This Blended Malt, aged in Bourbon and Sherry casks, has a rich structure, gently smoked. With complex notes of fresh fruits, vanilla, honey, this deep and warm whisky has the accessibility of a Blended Malt and the complexity of a Single Malt. The Whyte & Mackay packaging is evocative of the blue Scottish flag, reminding of the true spirit of this brand leader in Scotland, which is perfect harmony between centenary traditions and contemporary values. The Whyte & Mackay Company has been created on the Glasgow docks in 1844. With 4 malt distilleries and one grain distillery in the Highlands, Scotland, the Whyte & Mackay Company produces, assembles and bottles Scotch whisky and other spirits for the export market to many countries worldwide. Whyte & Mackay Scotch Whisky is the Scots first choice. In the 1870’s, with a choice of 35 malt whiskies and some grain whiskies of four regions in Scotland, the company created a blend that met tremendous success : the “Whyte & Mackay Special”. Nose: gourmet and vanilla-flavoured. Very much like a pastry cake: lemond curd, banana cake, spices like cinnamon and ginger. Slightly peated. Palate: malted and rich. The peat is here without hiding the other flavours. Toffee notes, roasted apples and pineapples as well. Finish: silky, a taste of grain, chocolate and black tea.